America Bikes is a national coalition of bicycle organizations that advocates for a federal transportation law that provides adequate funding for bike facilities. 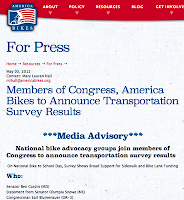 They are holding a press event next Wednesday morning, May 9, on the Hill to announce new survey data about Americans' attitudes towards federal funding for sidewalks and bike lanes. A House-Senate conference committee is scheduled to begin formal negotiations on the latest Transportation Bill on May 8. Senator Cardin (MD) and Representative Blumenauer (OR) will be at the press conference, as will Andy Clarke of the League of American Bicyclists and others, to mark the release and discuss the importance of biking and walking for transportation. The press conference will be on Wednesday, May 9 from 9:15 - 10:30 AM. At the House Triangle, located directly in front of the Capitol Building on the House side. The press event follows a National Bike to School Day celebration in Lincoln Park. From 7:30 - 8:30 a.m., school children will gather in Lincoln Park and ride in “bike trains” to nearby Capitol Hill public schools. If you are not involved in Bike to School Day consider attending the press conference to ensure there is a good showing of folks with bikes. Biking and walking funds are on the line-funds that benefit bike projects in Maryland, DC, and Virginia. Read the America Bikes press release about the event.